In sixth grade Religion we are using the textbook, We Believe, published by Sadlier. The emphasis of what we will learn this year will be the Old Testament. We will be using the textbook and Bible to study scripture, reflect on our actions, and to enrich our prayer lives. We will also look at the liturgical year and study how we celebrate. More can be learned about our text at www.webelieveweb.com. Students attend Mass every Wednesday. Sixth grade Reading classes will focus on building an understanding of both informational and fictional texts. We will use the Houghton Mifflin Harcourt reading textbook and several YA novel selections. Students will work on strategies to increase comprehension, to analyze the intent of a selection, to discern features of the text, and to understand story elements and structures. Assignments will include daily reading and completion of other projects and written pieces as appropriate. The English program includes areas of reading, grammar, and writing. Students will continue to develop their writing skills by employing the steps of the writing process. They include brainstorming, pre-writing activities, rough drafts, revising, editing, and final drafts. Rough drafts are required to be handwritten and turned in along with all final drafts. Students will have the opportunity to develop reflective, creative writing skills by responding to writing prompts. The grammar curriculum includes parts of speech, punctuation, and correct usage. 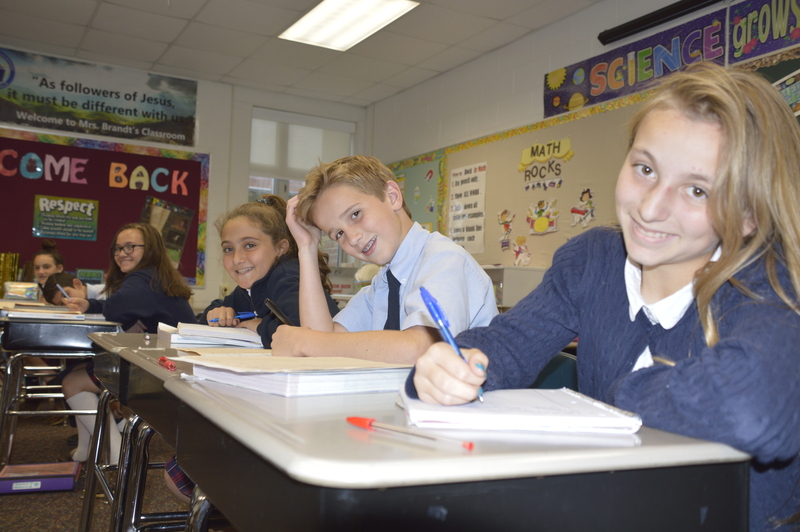 Sixth graders will develop a five paragraph, 2½ to 3-page biographical research report during the second semester. Mathematics: Prentice Hall Course 1 Mathematics is an exciting book that challenges the students’ cognitive and creative skills through problem-solving, reasoning, application and practice. This program is designed to develop a proficiency in basic skills of whole numbers, fractions, and decimals. We will also study ratios, proportions statistics, probability, pre-algebra concepts, and geometry. The students will have ample practice and review to ensure them the ability to use these skills in the everyday application of these mathematical concepts. The Science curriculum will cover the study of Earth Science. If you have not as yet taken time to look through your child’s textbook, please do so. The text is called Interactive Science published by Pearson. Your students have received a password and log-in to their online Science book. During the year you can expect them to learn, explore, and discover science using classroom activities, at home activities, Internet activities, textbook assignments, and power point presentations. Through experimentation, reading, and discussion, students will learn to apply their scientific problem-solving skills and knowledge to their everyday lives. In Social Studies we will use the text My World History published by Pearson. We will be exploring cultures and civilizations of the past to find out how our world works today. The main focus of our study will be in the Western Hemisphere, for example, Ancient Greece and Ancient Rome. We will learn about our unique Earth through the regions, locations, places, environments, religions, and movements of the past and present. Students will also review current events. They will be assessed on the political process and the major news events of the world. 6th-8th Gr. Jr. High Band. Band students are featured throughout the year: Homecoming Football Game, Cleveland Performance, Woodward Hills Nursing Center, St. Hugo’s Annual Christmas Pageant, Fine Arts Open House and the Spring Concert. Computers: In the upper grades the focus shifts to more advanced projects incorporating Internet research. These include Microsoft Office, Google Apps, Coding, photo editing, design and cross-curricular research projects. Finally, a key objective is to provide students with the digital literacy and critical thinking skills through project-based learning that include aspects of STEM that is required to become “information consumers” in the 21st century who continually evaluate content on the Internet. Library: How to find information on their own, Databases, Library Computer Catalog, Research projects, March is Reading Month Themed Weeks and activities, Book Tasting during March is Reading Month. Students in these grades can check out 2 books to take home for 2 weeks. Vocal Music, students will perform a choral concert at St. Hugo’s Fine Art’s Open House Thursday, 3/15 at 6:50 PM. Students will perform selections from Music Express Magazine. ALL students are required to participate, and all rehearsals take place during the school day. The goals of this program are teamwork, coordination, memorization, creativity, presentation skills, and music appreciation. It is a proven fact that music enhances a child’s ability to learn. This is a major production and your support both at school and home is important. Physical Education: In grades sixth, through eighth, we offer students a variety of opportunities to gain knowledge of and proficiency in the basic skills, exercises, and activities needed for body maintenance and the pursuit of leisure time activities. The goal is to allow each individual to gain an understanding of the human body and to be motivated to maintain a healthy lifestyle. Spanish: students continue to develop their skills toward language acquisition but at a more advanced level. Students are introduced to the linguistic requirements needed to complete a beginning level high school course. They practice writing short essays, listening to dialogues and information presented in Spanish, and talking and reading about themes related to the course. Students continue their cultural awareness by looking at specific topics relevant to Spanish speaking countries and studying the contributions of the Hispanic people and culture. STEM enrichment class: The students will be participating in one-quarter of STEM class. The focus will be on the Engineering aspect. The students will learn about, create, explore, and demonstrate simple machines through hands-on and interactive learning. Along with these machines, the students will gain an understanding of the different forces that work with and against the simple machines. Book Club enrichment class provides students with an opportunity to engage in collaborative discussions based on a novel. Each small group is given a contemporary novel to read within a literature circle, and specific tasks are assigned on a rotating basis. The literature circles are able to analyze character, plot, theme, and other story elements through their discussions, and evidence is provided in their work packets. After finishing the novels, students complete a project to show mastery of important details. 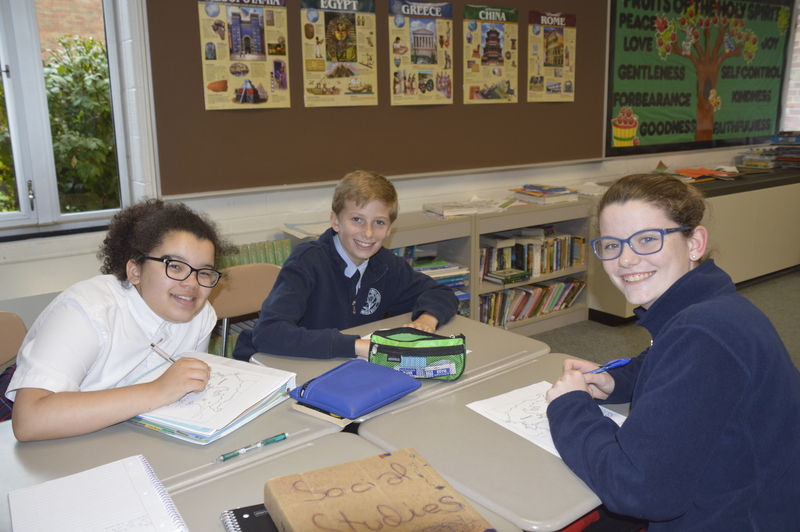 Geography enrichment class: In the 6th-grade geography class the students learn about Australia and New Zealand. They cover the history of the region, the climate, landforms, the various life forms of the region, the first peoples and their culture, the colonial times and their role in the 20th century. The students also learn about the United States; where the states are located and their nicknames. Students are also tested on their knowledge of countries; where they are located, what their capitals are, and what continents they can be found on.